Join their VIP Club and Boston Market will send you a $3 coupon within 24 hours good for your next purchase of $10 or more. Printable & Mobile: Print and get $3 discount on your entire meal over $10. Print or show coupon to server when ordering. 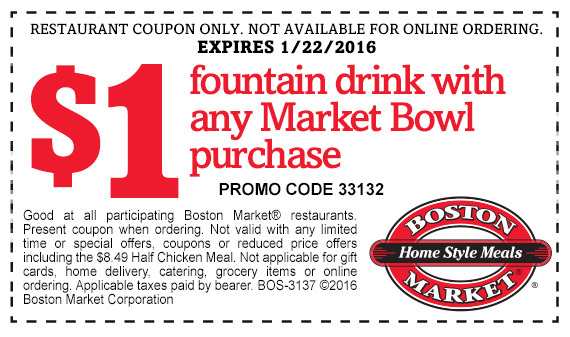 Dine In: Print this Boston Market coupon and get a half sandwich with a bowl of soup for only $5. 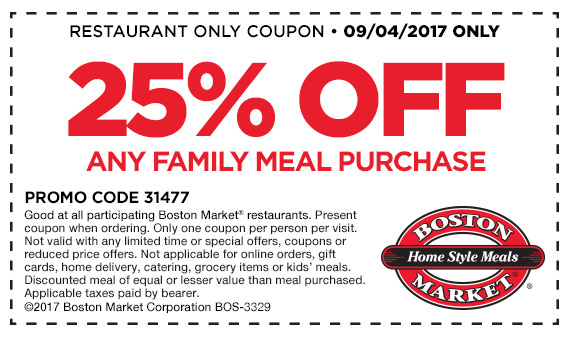 Dine at Boston Market on Labor Day and get 25% off any family meal. Print out this coupon to get a free mac and cheese side with any purchase. Printable Coupon: One whole chicken, one half ribs, 4 sides and 4 cornbreads only $29.99. Valid at all boston market restaurants. If ordering online use promo code: 33307 at checkout. Get a free 3rd regular side with any chicken individual meal purchase. Get a whole rotisserie chicken for only $1.99 when you purchase a family meal. Get a free individual dessert or regular side with no purchase necessary. Rotisserie chicken and hearty side dishes are the centerpiece of Boston Market’s Home Style Meals. Think traditional Thanksgiving favorites, served up all year long, and without the hassle! These coupons above will save you money on Boston Market’s chicken, turkey or meatloaf as well as their savory sides that include mashed potatoes, macaroni and cheese, and freshly steamed vegetables.